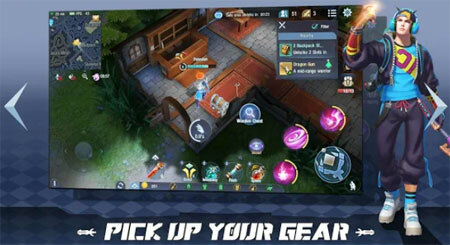 Survival Heroes – MOBA Battle Royale is a unique action game from Snail Games. Get ready to gather your friends, loot treasures and crush any others in your way. Come to bring out your inside hero, fight with other 99 real players and let’s see if you will be the last one standing. Every player starts the same in the valley of heroes. Go pick up your first weapon and have a fair fight with others, explore the vast land of dangerous creatures and loots. Be wary of the brush and mist, because you will never know what’s in there. Get to choose where you start, whether it is a hot dangerous spot or a distant area choose wisely because you only get one life per round. To be a true survivalist, you will need to improvise by picking up the right gear at the right moment. The game contains almost 30 distinct weapons, which give heroes hundreds of unique abilities to choose from. You can use the fierce firepower to kill everyone in your way, or if you prefer the sneaky beaky way, you can set traps, lurk in the brush and wait for your enemy to step on. If you get stuck in the game, check out the video walkthrough and gameplay for the game. This entry was posted in Android Games, iOS Games, Mobile Games, Walkthrough and tagged Survival Heroes Cheats, Survival Heroes Game, Survival Heroes Gameplay, Survival Heroes Guide, Survival Heroes Hints, Survival Heroes Review, Survival Heroes Solutions, Survival Heroes Strategy, Survival Heroes Tips, Survival Heroes Walkthrough by Marvin. Bookmark the permalink.